Many of you have asked “What school supplies should we purchase?” Listed below is a suggested list of supplies. We hope you find this helpful when the “Back to School Sales” begin. ***We are asking that students NOT have trapper keepers or school supplies that double as toys (bendable rulers, erasers shaped like toys, etc.) or oversized pencil boxes. We have limited desk and locker space and these items take up too much room. Extremely large backpacks may not fit into the lockers. 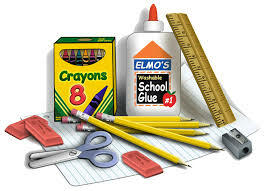 ***While school supplies are on great summer sales, it may be beneficial to purchase extra pencils and glue sticks to keep at home. These supplies could help your with homework AND they could be sent in to replenish your child’s supplies throughout the school year. Have a great summer! We can’t wait to spend the year with you!